The highlight of the film is quite easily the cinematography. Every detailed shot had its own intrigue and own story to keep you invested until you realize that the plot, if there is one, is just about evil Mexican cartel drug lords and possibly shady FBI agents. I found no new hook in the story; nothing to keep those of us who aren’t interested in that part of society invested in the film. It starts off well enough with Kate and partner Reggie Wayne (Daniel Kaluuya) discovering the remains of gruesome murders in suburban Arizona. Their relatable reaction of throwing up when seeing the bodies helps connect the audience to them. They are not hardened criminals or cynical law enforcers, they are just people who have to do a tough job. 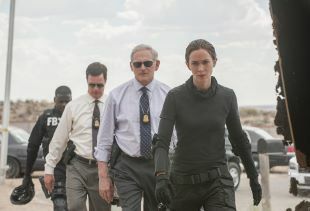 (Hank Rogerson, center left) and Reggie Wayne (Daniel Kaluuya, left) in SICARIO. Photo Credit: Richard Foreman. But those bodies were the work of some evil Mexican cartel drug lord, and Kate is enlisted to work with an elite government task force to bring him down. And this is when the film starts losing some of their audience. Reggie didn’t trust these new guys that Kate was working with, and that’s what I wanted to see more of, but he was left on the sidelines in favour of Matt Gravor (Josh Brolin) and Alejandro Gillick (Benicio Del Toro). Brolin’s CIA officer was for comic relief, and relief it was since Brolin delivered his lines with this sly wit which really fit the film. The major addition to the film is Del Toro’s Alejandro who fits the aforementioned role of possibly shady government agent, except you can remove the word “possibly”. And there was just nothing interesting about him. When Sicario left the comforts of the United States for the drug trafficking found along the Mexican border, it left behind everything to give it a wider audience. Kate no longer had much connection to the real world, and that means those of us who live in the real world don’t have much of a connection to her. There are people who like drug-trafficking thrillers, and Sicario would be great for them, but it’s not for the rest of us.